The Dutch Governor Simon van der Stel (1639-1712) acquired in 1685 southeast of Cape Town in the present day South Africa a plot of land of about 750 hectares, which he named "Constantia" (perseverance) according to his valued virtues (not his wife - as one often reads - because that was Johanna's name). But he was not the first, because already three years before there was founded a winery, which still today under the name Steenberg consists. Stel built the property to a princely estate and dealt with fruit and especially with viticulture. Great value he put on hygiene, He experimented with different grape varieties such as Palomino (which he called Fransdruif), Sémillon (whom he called Wyndruif), Chenin Blanc (called in South Africa Steen) and the red, autochthonous Pontac, From the white variety Muscat de Frontignan (in South Africa for Muscat Blanc ) became a partially gespriteter sweet wine which has achieved world-wide legendary reputation and has been delivered to all ruling houses in Europe. There were white, amber and red variants. How long this wine is, proves a tasting by the British wine author Hugh Johnson, In 1970, he was able to enjoy a glass from the vintage of 1830 (140 years old at the time of tasting) from a bottle whose cork sealed with wax. He described this crescent as amber-colored, sweet, full-bodied, and exceedingly harmonious. In 1699, Stel settled down, after his death in 1712, the large estate in the still existing three parts or wineries Groot Constantia. 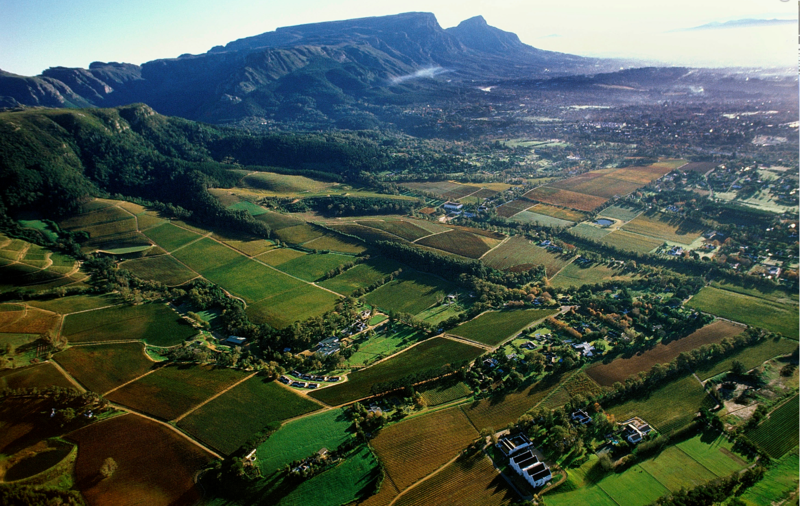 Little Constantia and Bergvliet (today Buitenverwachting ) divided up. The new owner of Klein Constantia Johann Colijn reunited the two parts Klein and Groot in 1733. However, the quality and reputation of the wine had suffered greatly during this time. In 1778, the rich landowner Hendrik Cloete, by the way, bought a descendant of a gardener of the first governor Jan van Riebeeck (1619-1677), the estate Groot Constantia. This succeeded in bringing the estate and also the wine back to old splendor and even greater glory. He was an absolute perfectionist, for example, he had 100 slaves chase every insect in the vineyards from the grapes. The first pressing process took place at that time by slaves who stomped the grapes after music sounds with the bare feet. His son Hendrik took over the estate in 1794, continued the tradition of excellent wine and even expanded it. The European rulers pulled the Constantia to other sweet wines like even Château d'Yquem. Tokaj or Madeira in front. He was one of the favorite wines from Napoleon (1769-1821), who had him delivered in large quantities in his exile on St. Helena until his death. The French citizen king Louis Philippe (1773-1850) even bought the entire vintage in 1833. From the 1860s, then began the descent unfortunately. First came the mildew and then the phylloxera South Africa and the customs barriers for French wine, which were abolished in 1861 by the new ruler of England, took care of the rest. At the end of the 19th century, wine production was discontinued. Groot Constantia was sold to the state in 1885 for only 10,000 Rand and there all Vines replaced by resistant varieties. Groot and Klein Constantia stopped producing wine at the beginning of the 20th century. This page was last modified at 2 September 2017 at 16:38.